Entrance Exam Held in Feb and April Results out for the Students who are seeking dmission into the Educational Society with Free Hostel Fecility. 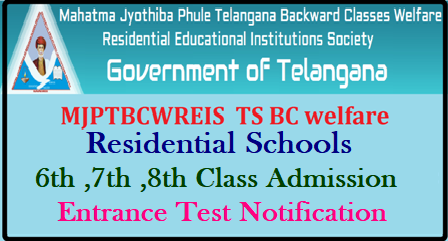 Intended Candidates may check their results in the Official Website With an aim to provide quality education to the students belonging to Backward Classes and other communities of below poverty line, Government have established Mahatma Jyothiba Phule Telangana Backward Classes Welfare Residential Educational Institutions Society in July, 2014. Loco parent system is implemented to look after and guide the student. 7.30 AM and the academic activities will continue till 9:00 PM. This Society also aims at exposure of talented students to quality education. The ratio for admission of students into BC Residential Schools is as follows: BC-A: 20%, BC-B: 28%, BC-C:3%, BC-D: 19%, BC-E: 4%, SC: 15%, ST: 6%, EBC: 2% and Orphans: 3%. Fishermen children: 46%, BC-A: 7%, BC-B: 10%, BC-C: 1%, BC-D: 7%, BC-E: 4%, SC: 15%, ST: 6%, EBC: 1%, Orphans: 3%. Budget : Government of Telangana provide entire budget under Grant in Aid (non-plan) towards maintenance of the above institutions. Residential Jr. Colleges for boys and girls with M.P.C., Bi.P.C., C.E.C. and M.E.C. groups. Present Status At present 19 BC Residential Junior Colleges (Boys-12, Girls-7) and 1 BC Residential Degree College for Women are functioning under the control of the Society. 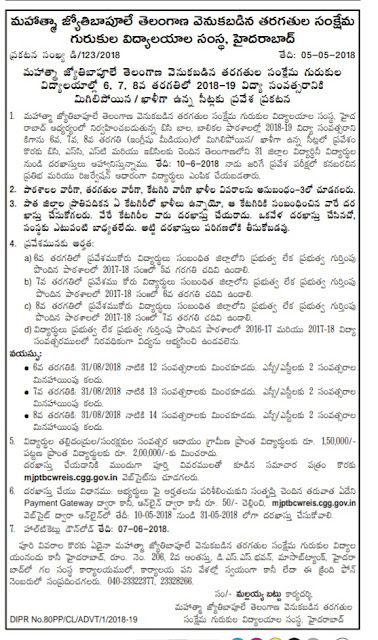 Colleges are located all over Telangana State. The medium of instruction in these institutions is English. The students appeared for X Class Examination March-2018 or its equivalent alone are eligible to appear for the Entrance Test. Advance Supplementary Candidates are not eligible for Admission. 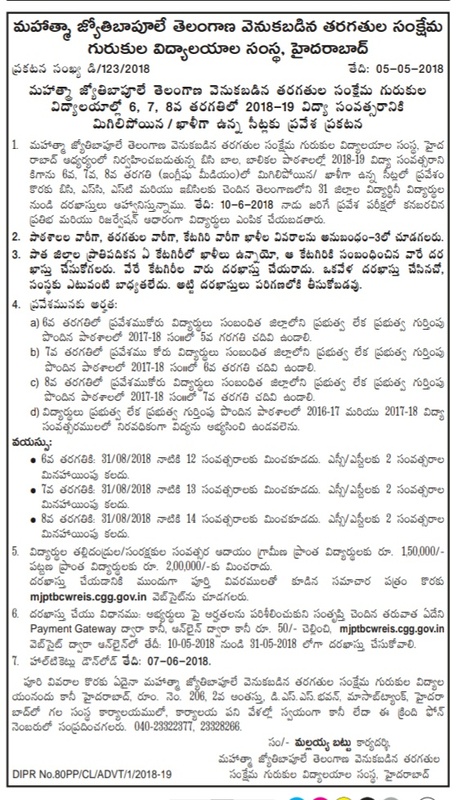 Last date for Submission of online applications: 31-05-2018. Date of Entrance Examination: 10-06-2018. The candidate shall first go through the information bulletin carefully, available in the website, satisfy his/her eligibility for appearing the written test. The candidate after satisfying himself/herself about the eligibility shall pay Rs.150/- through PAYMENT GATEWAY centres from 08-03-2018 to 11-04-2018 to enable to submit application online.